18″ w x 16.5″ d x 40″ h Weight 27 lbs. • Our Mobile Tablet Stand for Tablets is a petite mobile kiosk for your handheld touch device. 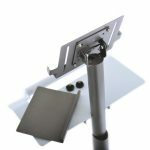 • Holds Your Tablet in a tilting mount, and has a simple keyboard surface, 18”w x 7.25”d. • Round Handle does double duty as a smooth wrist rest for quick, effortless keyboarding. Handle is integrated into the shelf and extends out 3.75”. • Worksurface is 40” high, comfortable standing height. • Choose the Level of Security that’s right for you! 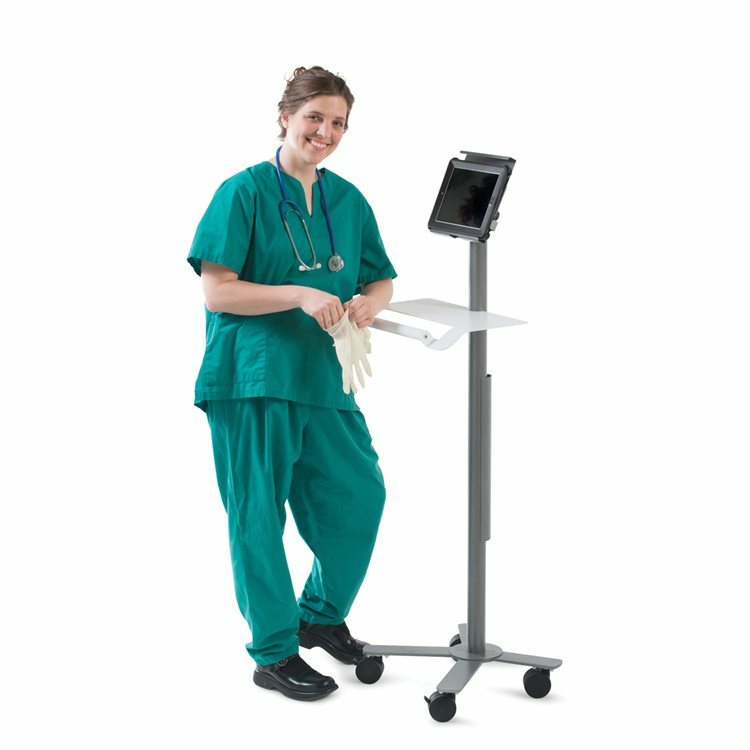 Our Mobile Tablet Stand comes with three options. 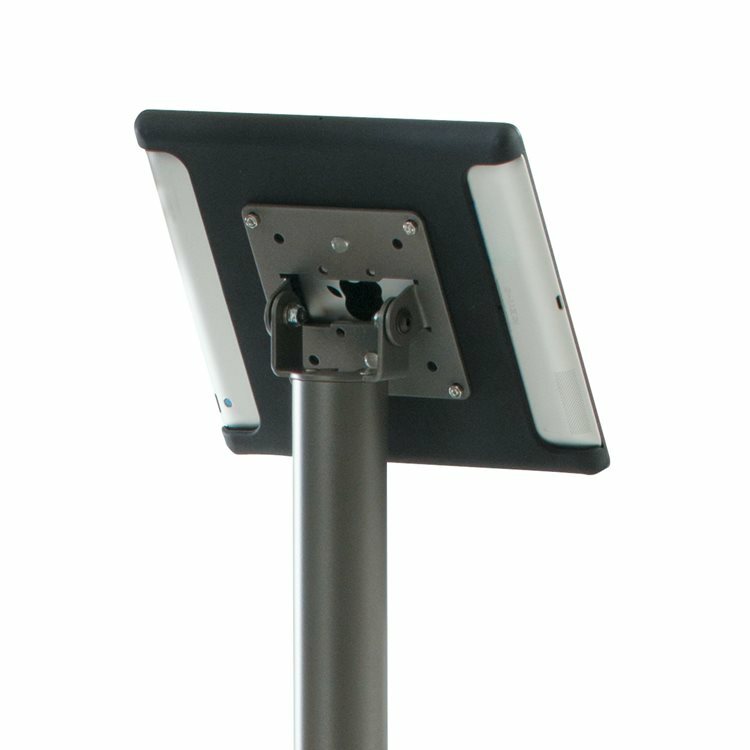 First, hard mount your tablet case directly to the VESA mount at the top of the column. Second, add the 12″ wide easel to the VESA mount and place your tablet on the cart for quick data entry, either directly on the tablet or using a keyboard on the shelf. 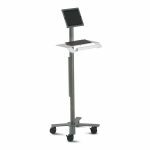 Third, add the top grip to the easel to hold the top of your tablet so you have a little extra stability if you move the cart around a lot. 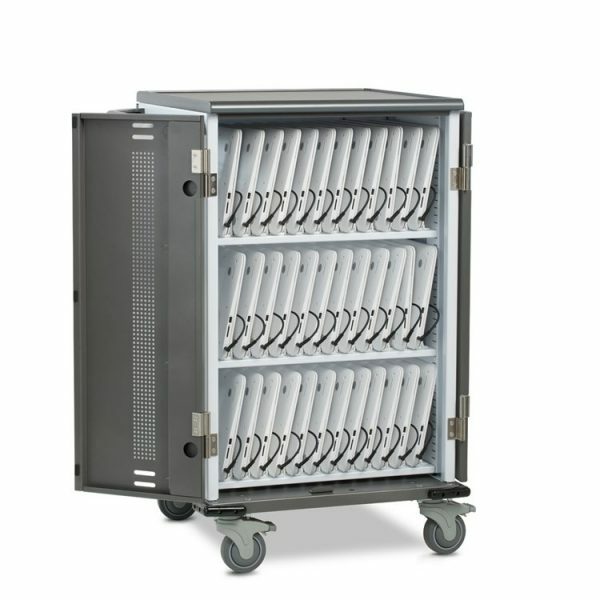 • Slip on Cable Sleeve organizes and protects cords and cables along the column. 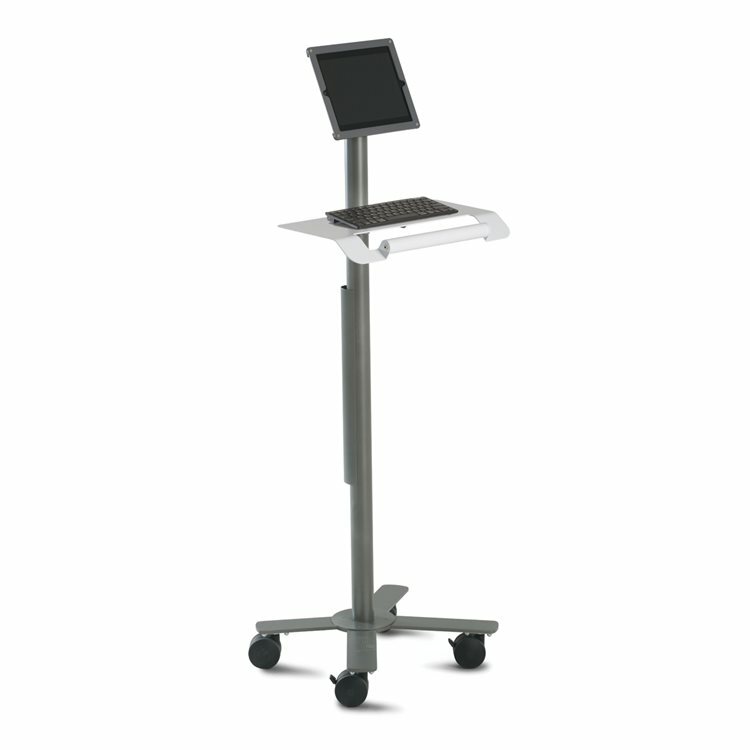 • Slim Size fits into small exam rooms or makes a mobile kiosk in hallways or showrooms. • Weighs a Very Light 27 lbs. 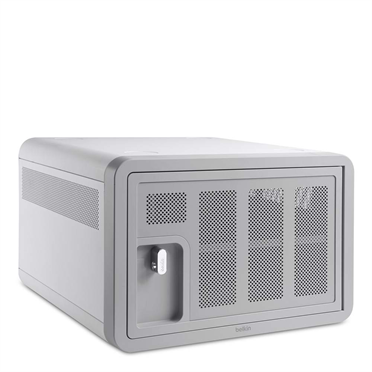 so it moves effortlessly on twin wheel 3” casters, two locking. 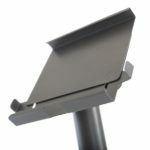 • All Metal Construction makes it easy to clean. 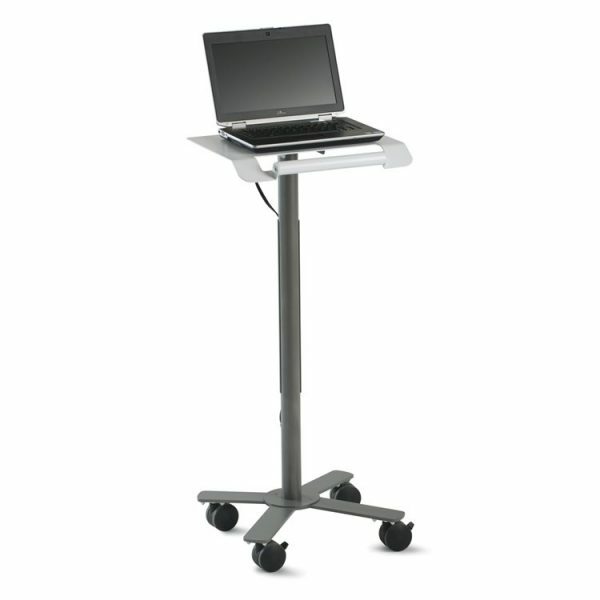 Durable baked on powder coat finish stands up to regular cleanings. 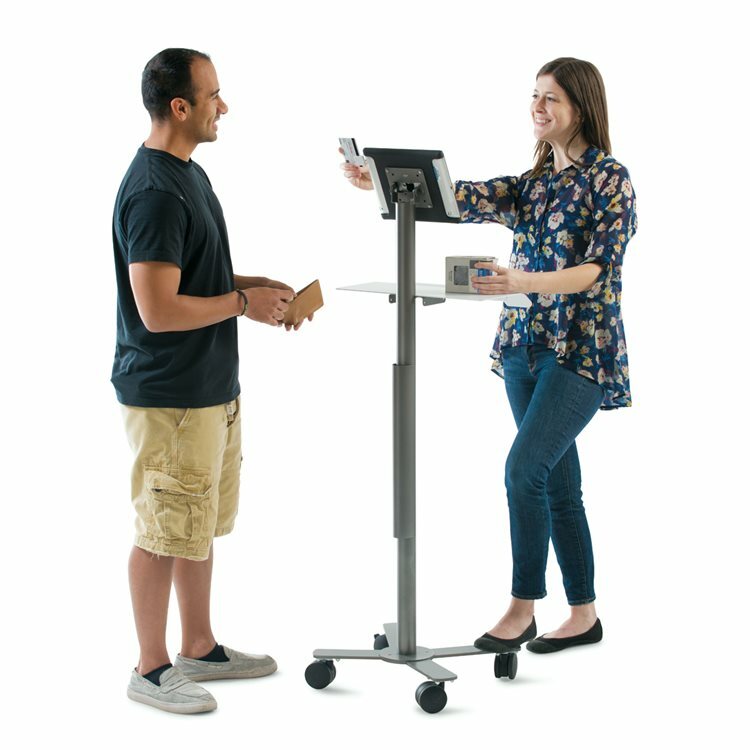 • Cart holds 10 lbs overall. 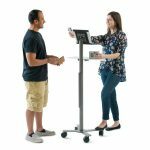 • Comes With one tilting tablet mount assembly, one metal shelf with integrated handle, 2” diameter column, 17” long snap on cable sleeve, four point base, and four 3” casters, two locking. • Comes with a Lifetime Warranty against manufacturing defects. 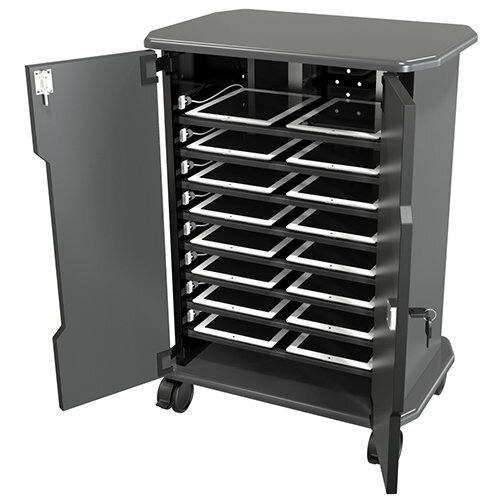 • Available In Grey Metallic with Polar White handle and shelf.